'Two young gentlemen and a sailor boxing,' Robert Pollard, date unknown, British Museum. 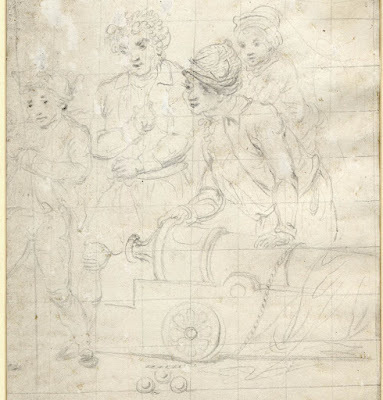 'Three men standing by a cannon, another figure boxing to left,' Robert Pollard, date unknown, British Museum. Robert Pollard was a painter and engraver who was especially active in the 1780's, though also well beyond. Maritime subjects were a favorite of Pollard's, and especially catastrophic wrecks like the Halsewell, Centaur, and Grosvenor. 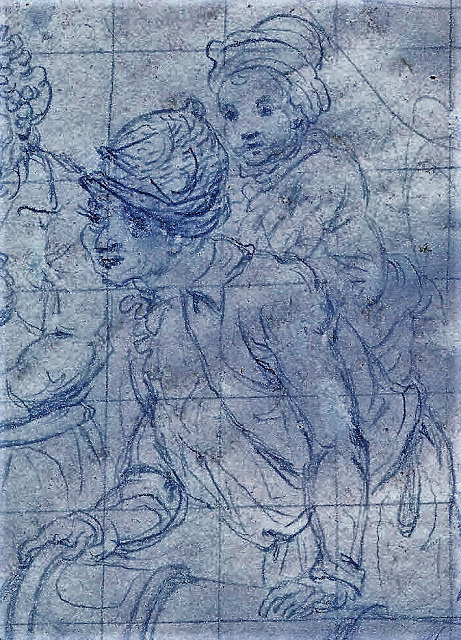 In these sketches, perhaps studies for an unfinished engraving, are in a different vein. Two officers stand casually, half watching a boxing match between a sailor and a young man in a cocked hat with cockade who wears a queue. Given the length of the young fellow's hair and the cockade on his hat, it is possible that he is a midshipman. This is interesting, in that he appears to be fighting a common sailor, with short cut hair, in his shirtsleeves, and striped trousers. Perhaps he is also a midshipman, and wearing working clothes, but it is an odd juxtaposition. In any case, everyone seems to be enjoying themselves, save for the midshipman himself, who looks rather worried. 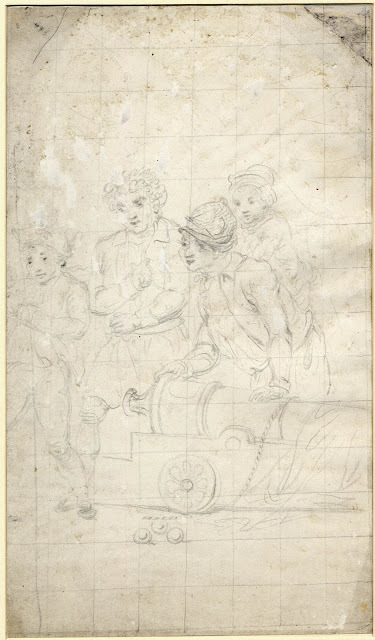 On the passage, one day, for the diversion of those gentlemen, all the boys were called on the quarter-deck, and were paired proportionally, and then made to fight; after which the gentleman gave the combatants five to nine shillings each. This was the first time I ever fought with a white boy; and I never knew what it was to have a bloody nose before. This made me fight most desperately; I suppose considerably more than an hour; and at last, both of us being weary, we were parted. I had a great deal of this kind of sport afterwards, in which the captain and the ship's company used very much to encourage me. Given that this is a rather aged sketch, I have taken the liberty of enhancing it a touch so that we might better see the sailors at their game. Our hatless boxer wears close cut and wavy hair. A few lined at the back of his head give the hint of what might be a handkerchief, but I can't be sure. His plain shirt does not appear to have its sleeves rolled up, but is tucked into trousers with vertical stripes that run down to the top of his ankles. While the nervous boxer stands in the far left of the frame, three smiling sailors watch his progress. This mariner wears his curly hair loose and cut well above the shoulder. His jacket has a calling collar, and it appears that he is wearing a closely knotted neckcloth. His waistcoat is open to at least the center of the chest. 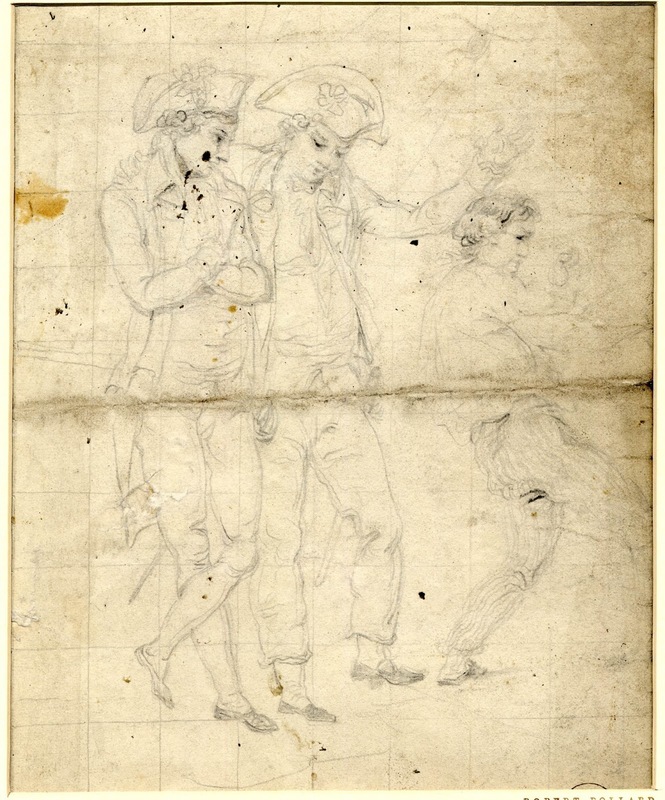 Around his waist is a pair of petticoat trousers, with breeches perfectly visible on his right knee. These two wear caps of differing styles. The one in the foreground appears to be wearing a knit cap, which may also be the case with his mate. Both wear the same style of jacket as the sailor to the left, and notable the sailor in foreground here wears a ruffled garment at his neck. While I cannot be sure if he wears trousers or petticoat trousers, the pocket is perfectly clear.